It's been a while since I've reviewed a Cast Puzzle. 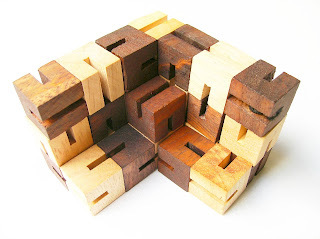 One of the reasons is that I wanted to review other types of puzzles as well, to keep the blog's contents varied. With that task accomplished, I decided it was time to write another Cast Puzzle review. ... And what better way to resume these reviews than an Oskar van Deventer design? 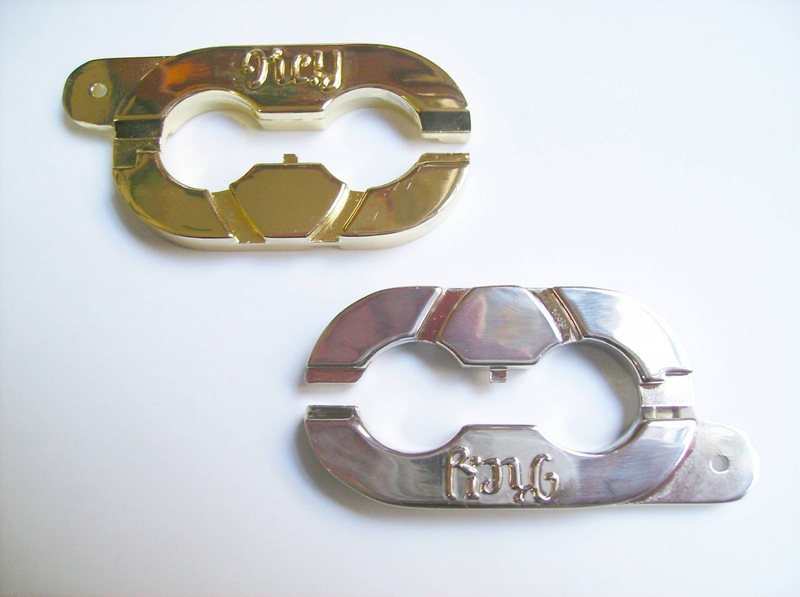 - Released in December 2001 by Hanayama, the Cast Keyring is level 2 out of 6 and PuzzleMaster rates it equivalently at 6/10. As you might have guessed, it's a relatively easy one. One curious thing of the Cast Keyring is that it can actually be turned into a key ring. If you look closely, you'll see a tiny hole at one of the extremities, which is large enough to attach a ring to hang your keys. The puzzle consists of two identical pieces, although as Hanayama does best, they've coated one in golden and the other one in silver, to better distinguish them apart. 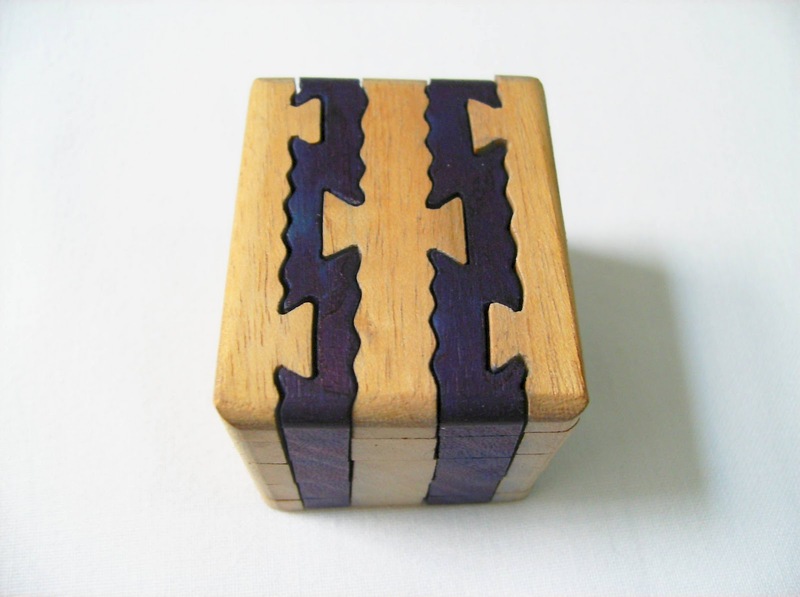 These two pieces are interlocked, perpendicular in relation to each other's plane, and your objective is to separate them. To make things a bit more difficult, the pieces can't move freely, without some strategy. There are a couple of indentations at the front of each piece and one at the back, and a pin at the center, which will fit right into these indentations. In order to separate the pieces, you'll need to rotate one of them so that both exits can be at the same direction of movement. Sounds complicated, but trust me, once you try it for yourself, you'll see that after a few minutes of fiddling with the puzzle, it'll be solved. For another challenge, simply put back the pieces together. However, to make sure that you have succeeded, you need to look at the words read from each piece. Seen from one angle, you can read "Key", but if you turn it upside down, you will read "Ring" instead. 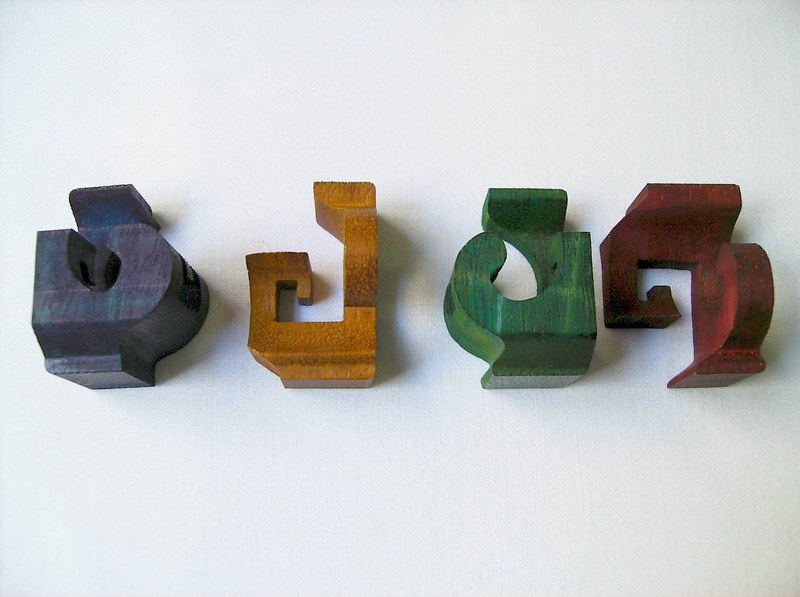 This nice word play is beautifully done by Scott Kim and is called an ambigram. If you need a graphical solution, check out Puzzlemaster's here. I loved the design of the Cast Keyring. You can't go wrong when you combine design excellence from Oskar and high-quality finish by Hanayama. The puzzle is small, but feels heavy and sturdy. 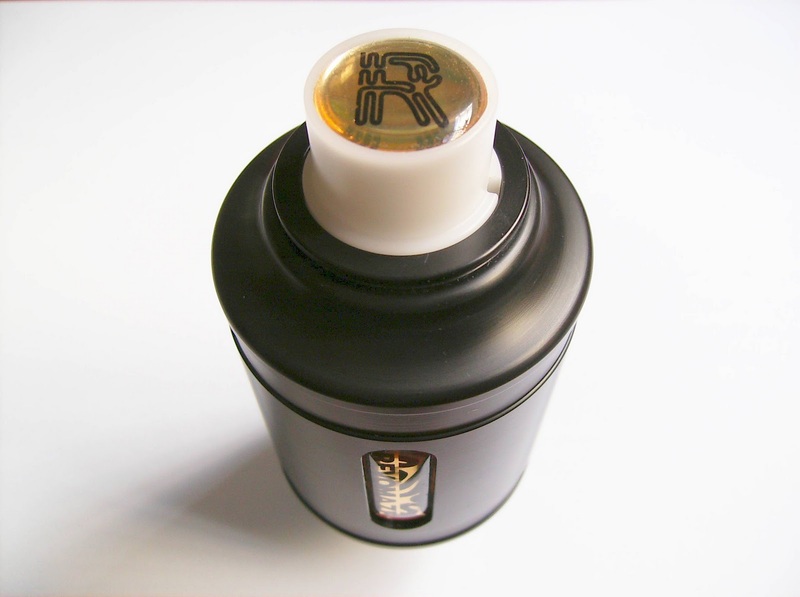 The coating is flawless and the ambigram with the "Key" and "Ring" words is a clever touch. 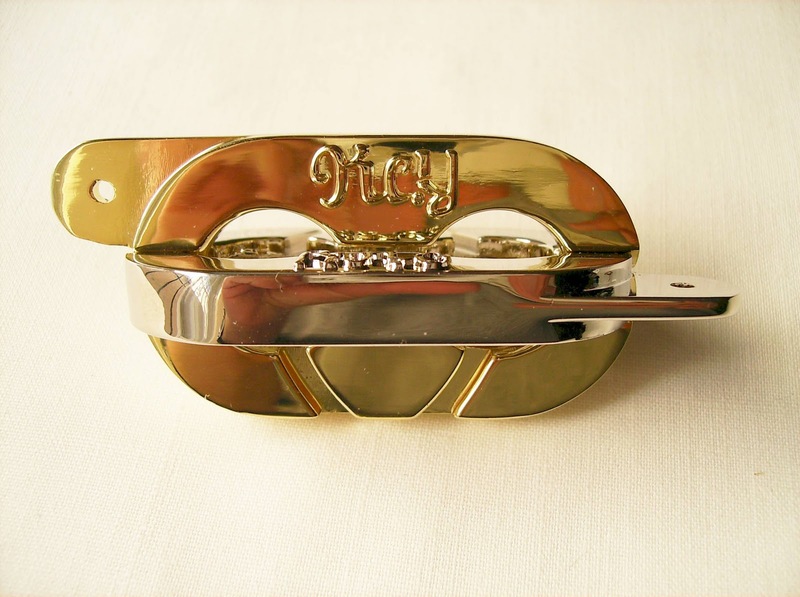 For being an easy puzzle, it's recommended to those that are new to the Hanayama Cast Series and want to have a little fun, without being too much frustrated. The Cast Keyring and all the other ones in the Hanayama Cast Series can be found at PuzzleMaster.ca. The Bishop Cubes were yet another entry of last year's 31st IPP. 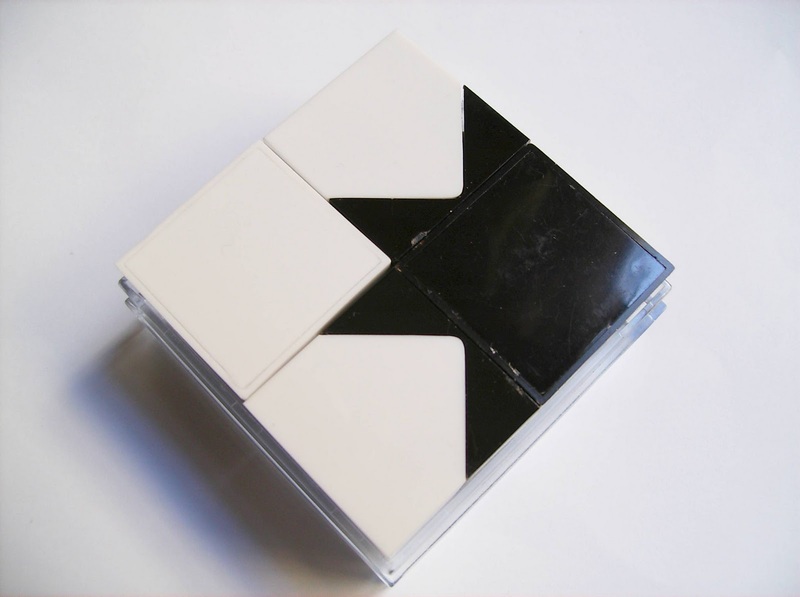 Invented by Forrest Bishop, in 1992, this shape-shifting puzzle was finally made commercial available in late 2010. 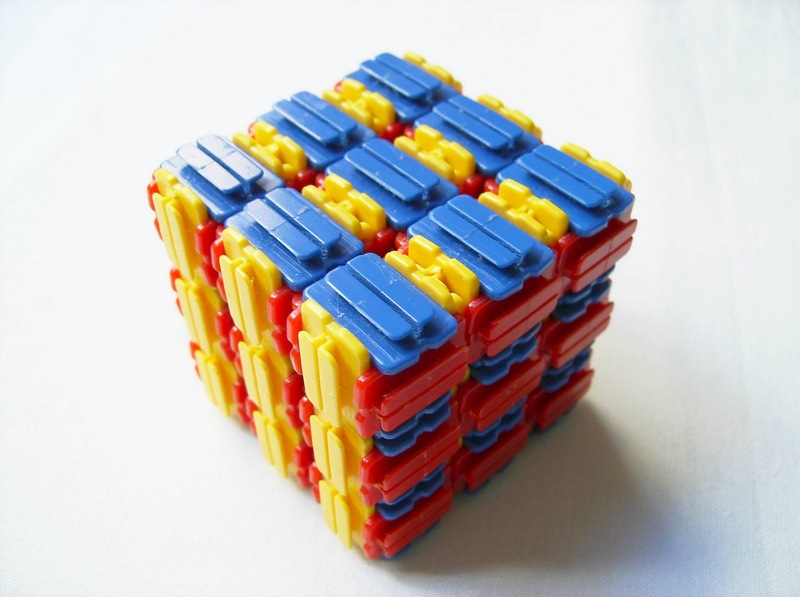 A set of Bishop Cubes contains 27 colored smaller cubes in a 3x3x3 cube. 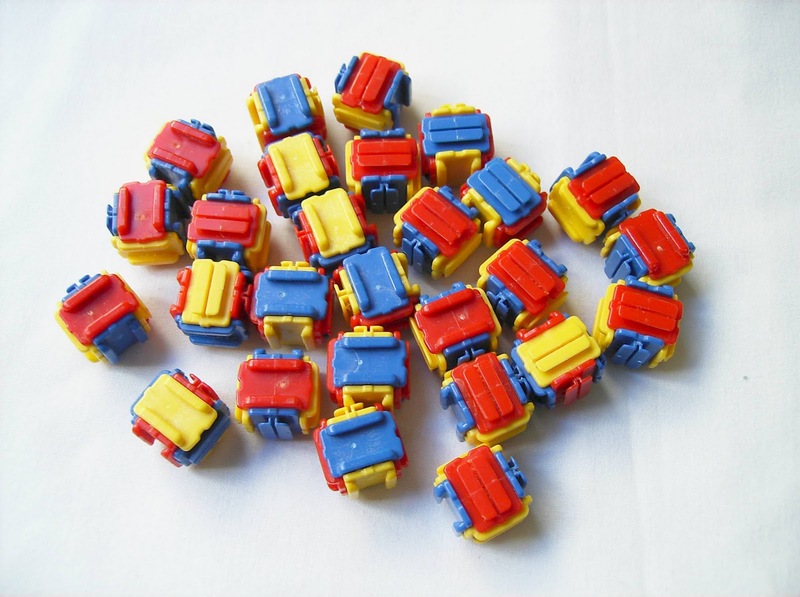 Each cube has three colors (yellow, red and blue), and two types of tracks - one for every opposite face. This track design is what makes the cubes slide within the limits of the cube and allow countless shapes to be formed. There are various challenges that you can try. The most obvious is to change the cube to a random shape and then return it to its original form. 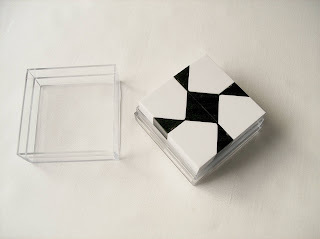 You can also change from one shape to another, but keeping in mind not to disconnect any cube from the set. By taking advantage of the cube's colors, you can try to make different colored patterns. 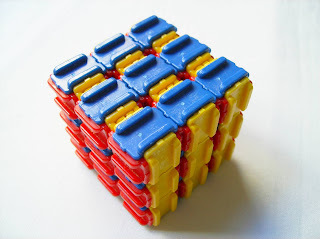 Finally, a simple, but also challenging task is to move one particular cube from one part of the cube to another, with the same rule of not disconnect any cubes. To move a certain number of cubes, there are three possibilities. They will slide accordingly in one of three axis at a time (xyz). A nice feature to let you know that they were moved correctly is by a form of a "click", otherwise they would just slide off the edge. 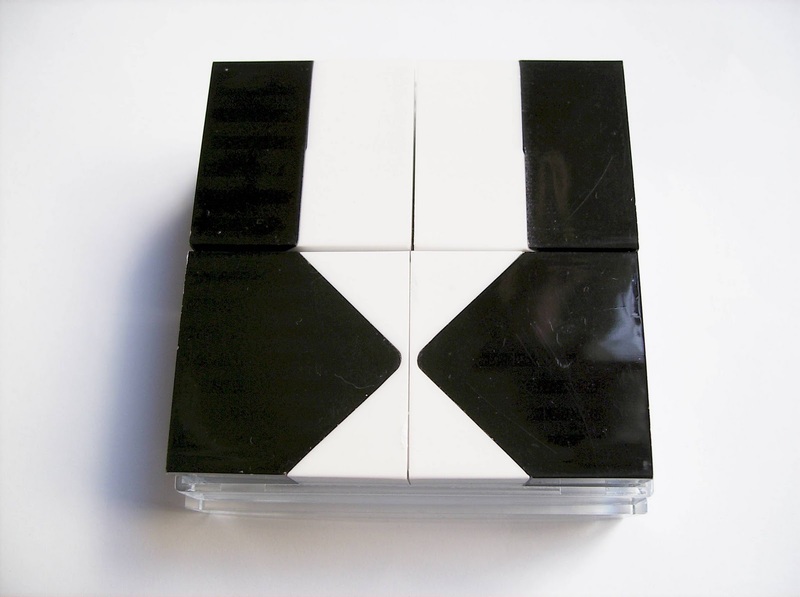 To get more acquainted with the puzzle's mechanics, you can take eight individual cubes and build a smaller 2x2x2 cube. This way, it gets much simpler to learn how the cubes interact with each other, before attempting other more complex challenges. There are also three basic moves you should know: the slab move, which makes a sheet of cubes slide back and forth; the row move, as the name suggests, only moves one row in a certain direction; and finally the single-cube move will of course let you slide a cube at a time when one and only one face is connected to the set. The first challenge that I tried was to scramble the cube and solve it to its form again. This proved to be much harder than I was expecting. After only a few random movements, the puzzle form was beyond recognition and when I tried to reverse the movements, it did more damage than good. 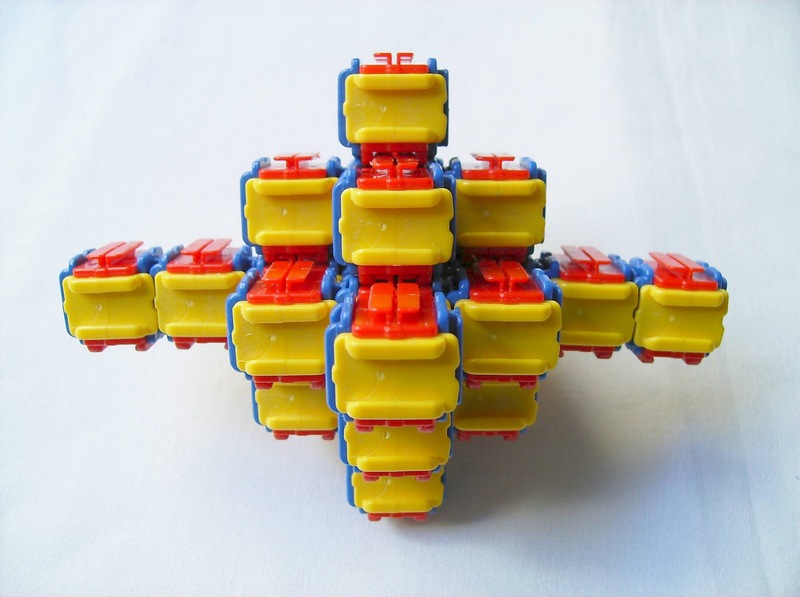 I remember that it took more than one hour to finally get it to a cube shape again. 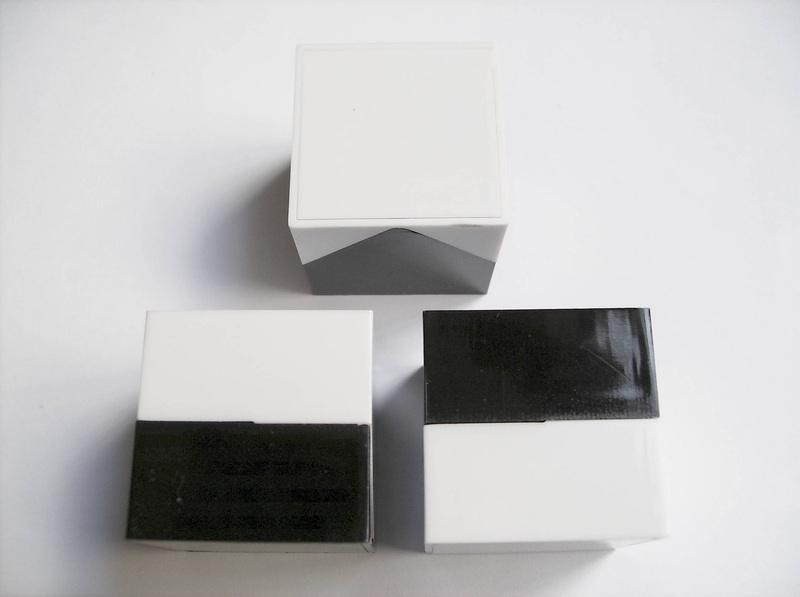 To buy your set of Bishop Cubes, just stop by their official website. 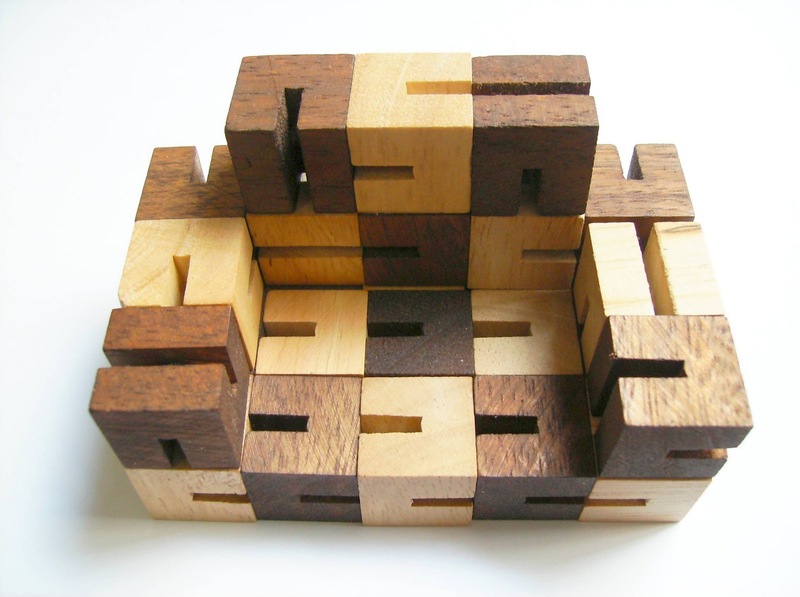 The Bishop Cubes is an original puzzle that takes the shape-shifting category to a whole new level. It's extremely fun to solve, just by returning it to a cube form and the extra challenges are a nice way to keep it fresh, avoiding this way to get bored more quickly. As many other shape-shifting puzzles, there's no particular goal. 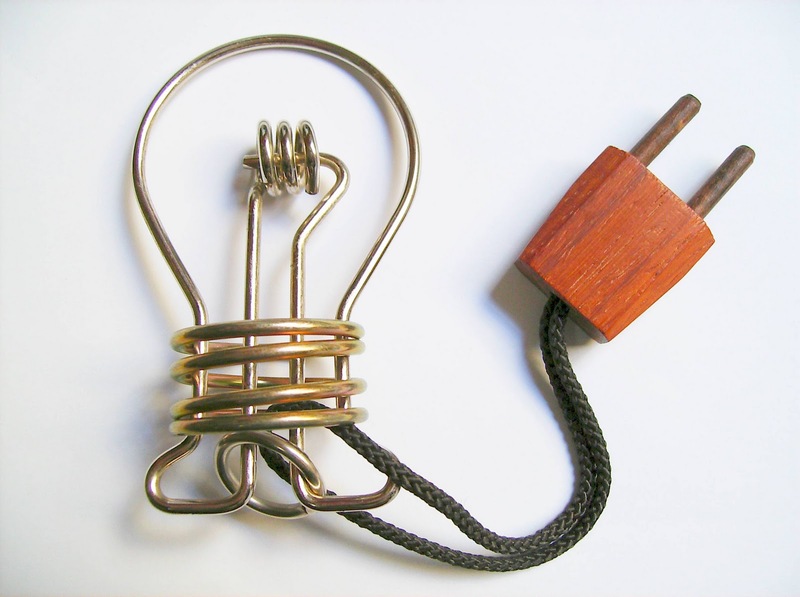 Your creativity is your ultimate building tool. How many different shapes can you build? This is my second review of a Jean Claude Constantin puzzle in a week... No wonder, I'm becoming more and more a fan of his work. Each and everyone of his puzzle designs is unique and very original. I own several puzzles of him in my collection and I love all of them. Today, I present to you an Assembly/Packing Puzzle by the name of Apothekerschrank (that's German for Apothecary Cabinet), but it's also known as the Pharmacist's Cabinet, the Apocathary Chest or even the Drawers Chest. It seems that every store selling this puzzle, calls it a different name. The latter is named by Brilliant Puzzles, where I got mine. The Apothekerschrank is beautifully crafted in wood to resemble a cabinet full of drawers. The handles are made from a darker wooden tone, that accentuates the contrast between the frame and the pieces. When I first saw it online, it looked bigger, but actually it just measures 14cm x 10.5cm x 3.5cm (5.51" x 4.13" x 1.37"). By the way, the measurements at Brilliant Puzzles are wrong and apparently, I have the exact same version. At first sight, all the drawers look exactly the same, but once you start analyzing each one, you notice that every single one has a slightly different configuration. All sixteen drawers occupy the tray area in a 4x4 arrangement and each one is unique, although they follow a simple rule when you group them together. Before my first attempt, I was a bit afraid that it would take a long time to solve, because it seemed a lot more complex than it actually is. The unique configuration of each piece led me to think that only one solution was possible. I started by selecting the pieces that could fit in the first slot and when I chose one, I just continued with that strategy. When I was almost done, only three pieces remained, but couldn't fit them anymore. So, by swapping a couple of pieces I was able to fit one more. Now there were only two pieces left... After swapping places with just a few more drawers, the puzzle was solved... I couldn't believe it! It only had taken me just about 10 minutes to solve the puzzle and I thought to myself: "Well done, you genius!". I was a bit suspicious, though, and with that in mind, I took a look at the solution sheet provided. I was then able to confirm that it had at least, more than one possible solution. Later, I searched for information about it and found on the designer's website, that he classified it as a two star level puzzle out of six. Moreover, PuzzleMaster classified it as a 6 out of 10. I was a little disappointed, as indeed, it wasn't a stroke of genius, because the puzzle is pretty much, easy to solve. Because of this easiness to find a solution and even though I'm not sure, I can most certainly assume that it has several other solutions. When I was separating the pieces for the photos and grouping them in similar pieces, I discovered an even easier solution. All the pieces are different, but not in a random way. They form an easy to spot pattern that proves to be very helpful to pack them. You can see this in the photo below. Although, the arrangement seen isn't the final configuration, it doesn't differ much from the actual solution. As pointed at the beginning of the review, there are a few online stores that sell the Apothekerschrank, but as you can verify for yourself, the most affordable option is the Brilliant Puzzles' version at $16.95. PuzzleMaster sells a much more stylish version with the drawers' handles in stainless steel, but at about $44 and more than two and a half times the price that I paid, to me, it's simply not worth it. There's also a version at Creative Crafthouse, very similar to the one I have, for $22 and finally, in Europe, Sloyd.fi sells another version for €33 (≈ $43). Even though the solution is deceivingly easy, I love the concept of the Apothekerschrank and it's extremely fun to solve. 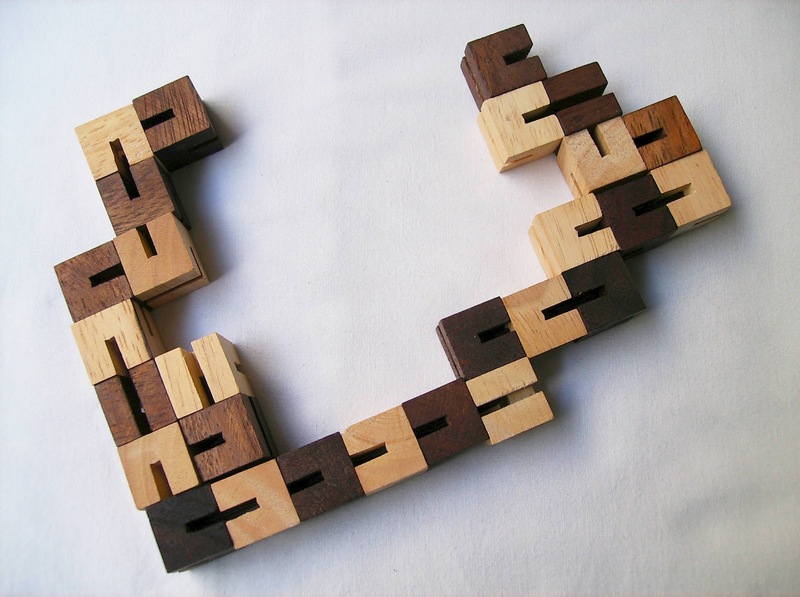 It's ideas like these that makes me appreciate puzzles even more and ultimately, collect them. 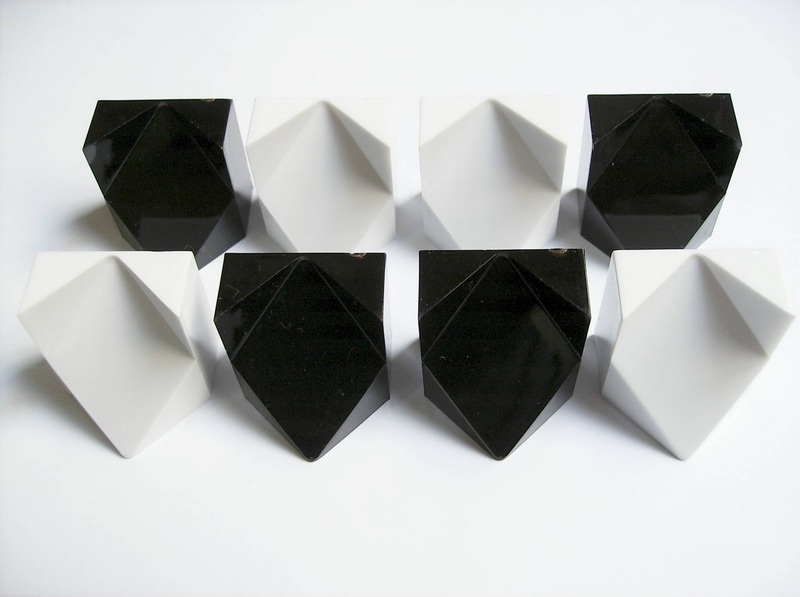 K-Dron is an eleven-sided geometrical form, invented by the Polish Janusz Kapusta in 1985. 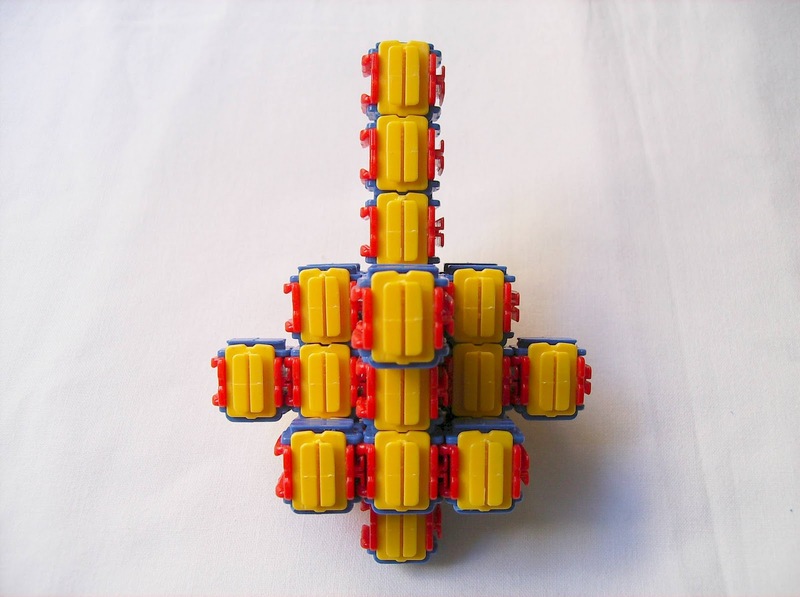 He found many uses for this kind of shape and one of them was the K-Dron puzzle. 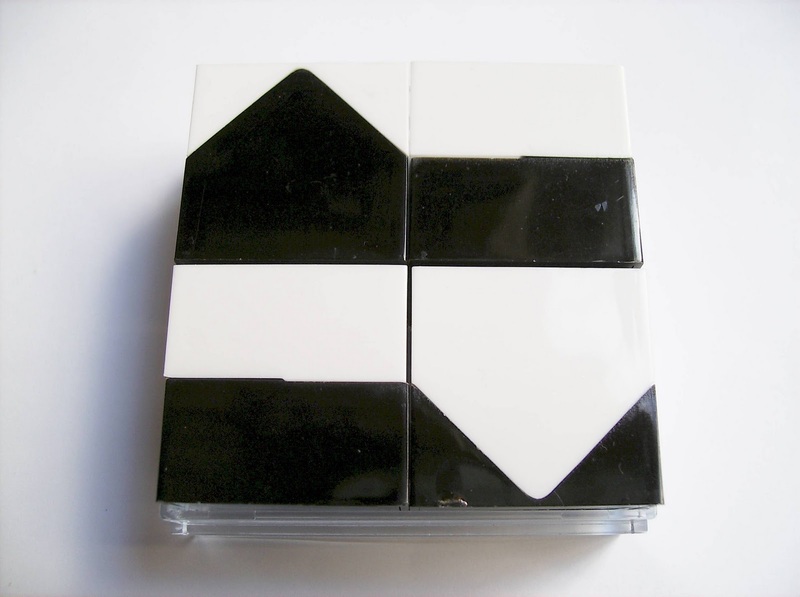 The K-Dron puzzle consists of eight pieces, four black and four white. 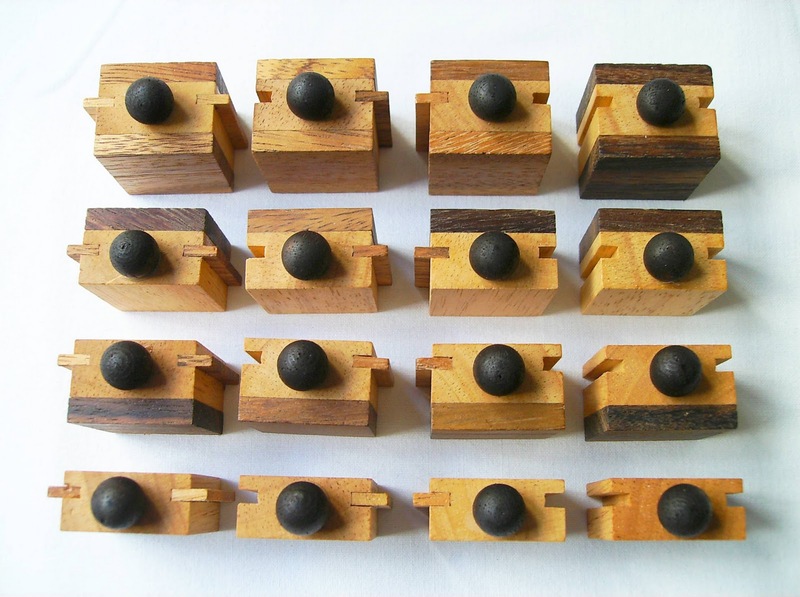 They all have the same form, but when two are placed on top of each other, they form a cube. 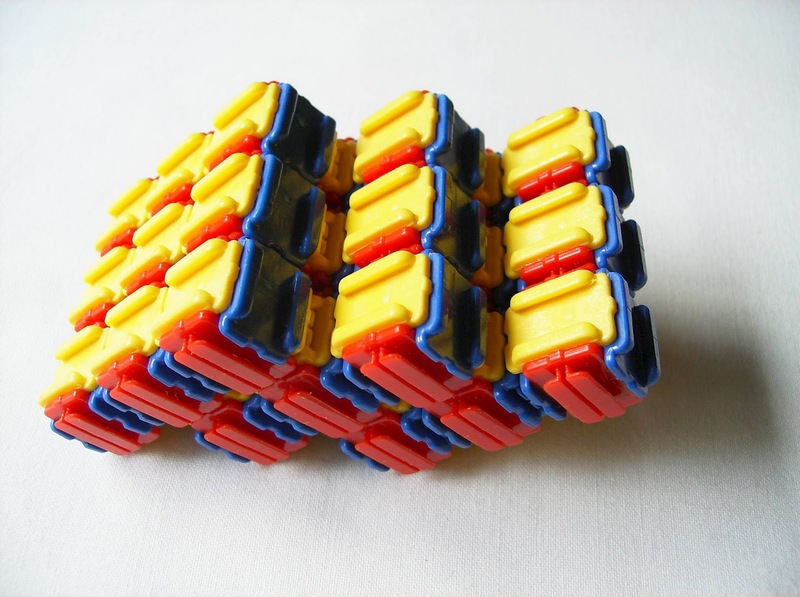 This cube, in turn, shows different arrangements in each of its six sides, that can be used to create thousands of possible patterns (38,416 to be exact), just by turning and flipping the cubes. The puzzle comes in a handy transparent case that can be used as a base to create your patterns. 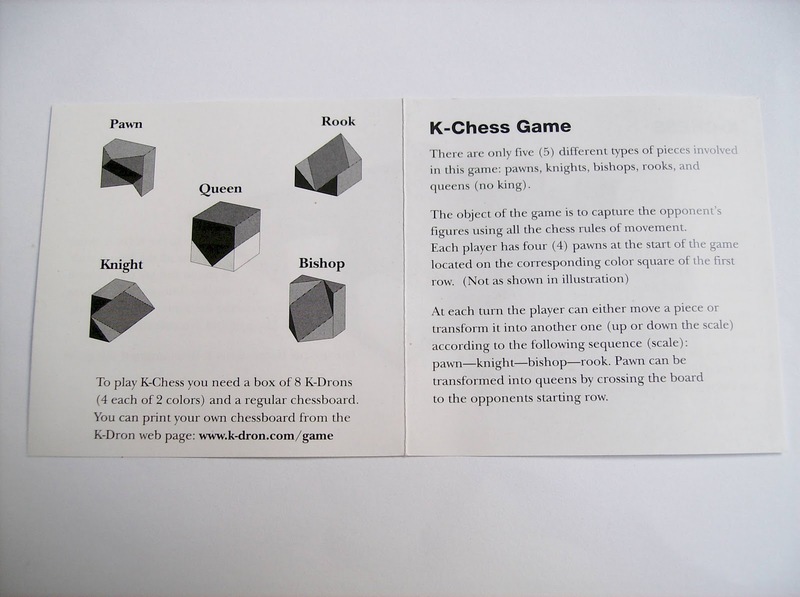 To make the puzzle more interesting and challenging, there's already included in the package, a leaflet with 72 challenges divided in three levels of difficulty. Many of the challenges in the harder level are quite challenging, as the patterns shown are viewed from a 45º, unlike the other two levels where the patterns are viewed as a regular square. A curious and cool thing I've noticed when I was playing with it, is that when you finish a pattern, you can see on the opposite side, the negative version of that particular pattern. To better view this result, just close the case and flip it. In the photo below, there's an example of a pattern and its negative version. Before buying the K-Dron puzzle, I read several negative comments about it in a few websites and honestly, I couldn't disagree more with these people. Clearly, the comments came from someone that understands very little about puzzles and doesn't comprehend what they're supposed to do with it, besides making "pointless patterns". Sure, you make patterns with it, which by the way I love to do, but what could you expect from such a puzzle? - Well, if you do get bored with making patterns, there's another use you can give to it and it's called K-Chess. This simplified Chess version reflects the society we see today, and for that reason, you play it with only eight pieces, four assigned to each player. 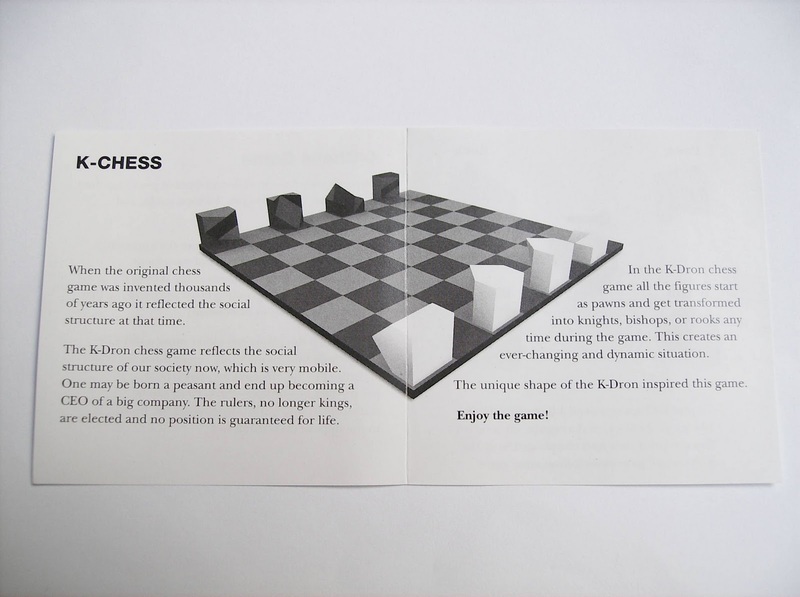 Check the photos below to know more about K-Chess. 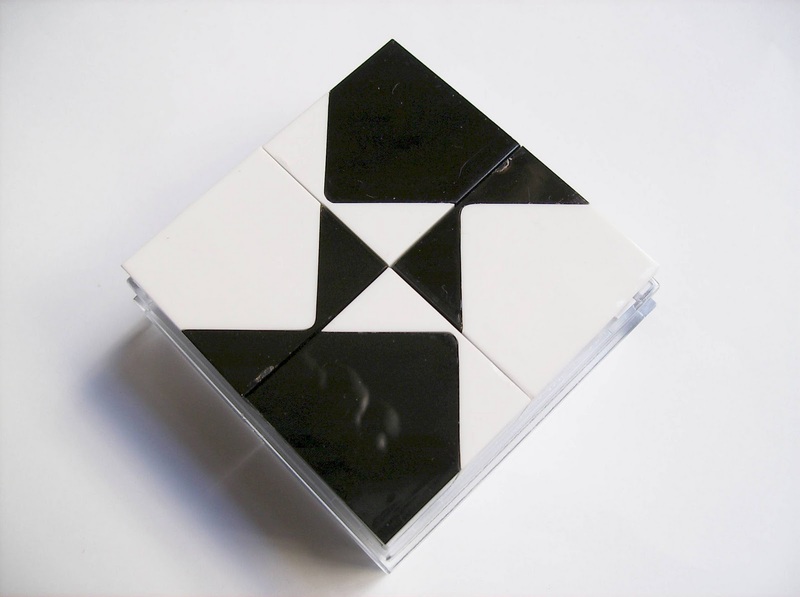 There's also an interactive version of the K-Dron puzzle on their website, which requires you to have the original set. By showing you a certain pattern, you try to recreate it with your blocks in the fastest time possible, in order to advance to the next level. Each time you play, there's 10 different challenges, so there's plenty to do before you get bored. Note: For you to have an idea of what can be done, you can see here, the challenges that came with the puzzle's leaflet as some of its possible patterns. I bought my copy of K-Dron at a Portuguese online store, but I think you can get one at Amazon. PuzzleMaster also sells it, but it's been out of stock for quite some time, so it's better to send them an e-mail first and ask. 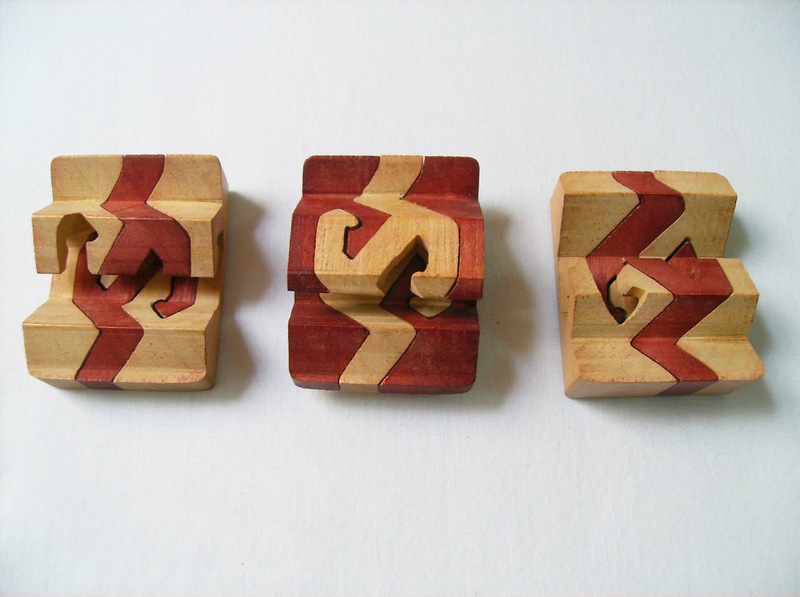 Shape-shifting puzzles have been around for quite some time. The Rubik's Snake comes to mind, for example, but there are lots more. 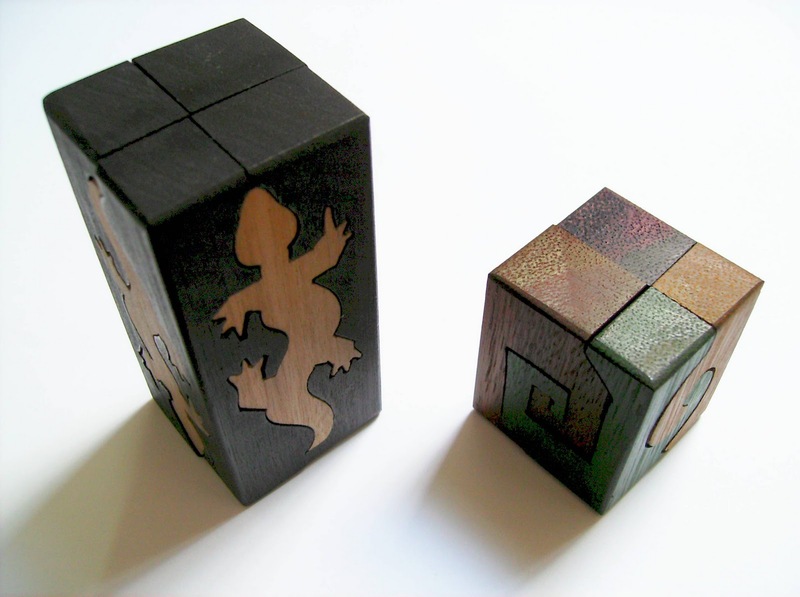 Puzzle Crafthouse has taken this concept and created the Shapeshifter, with larger wooden blocks and a bigger length. 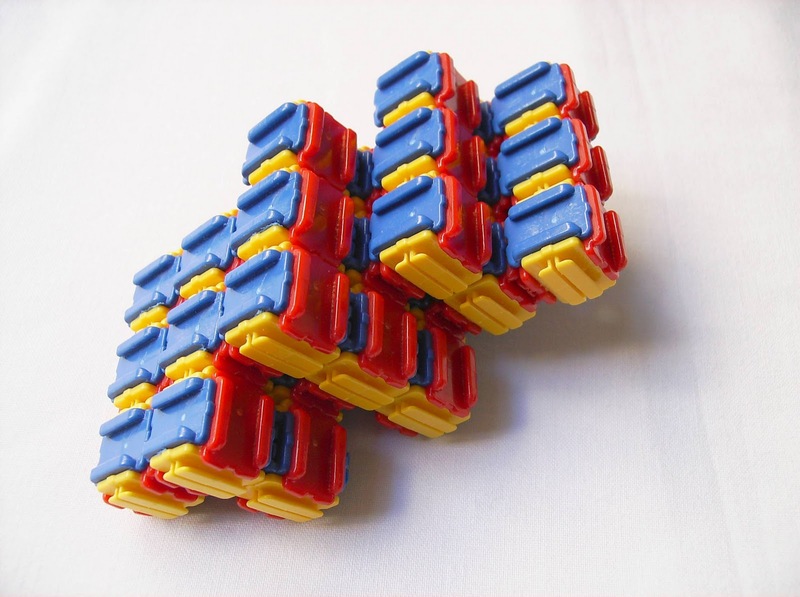 The Shapeshifter, as the name suggests, can create many different shapes with a chain of 27 blocks held together by an elastic string. 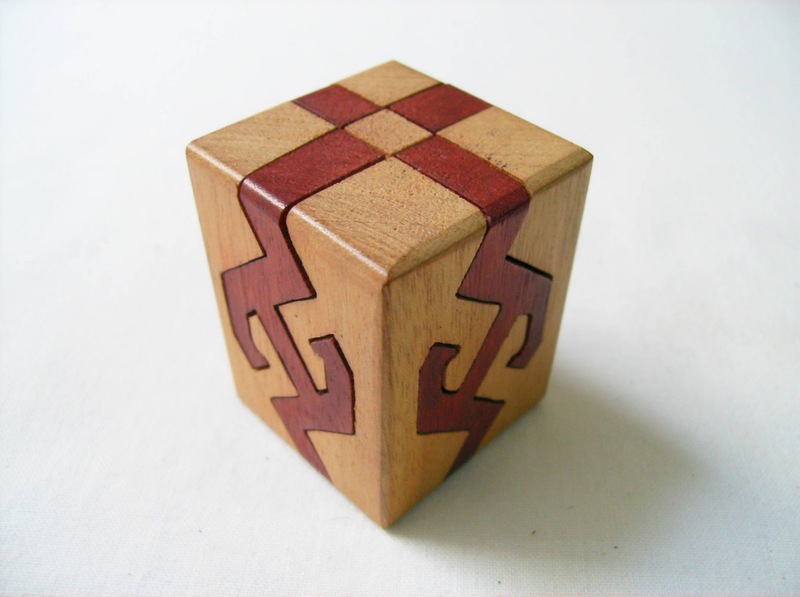 The puzzle comes in a cube form with a checkered pattern, but there's no single solution. The solution is just to build the shape you're thinking of. To get you started, comes included with the puzzle, 18 shapes for you to build. Some are easy to do, but others can get pretty complex. 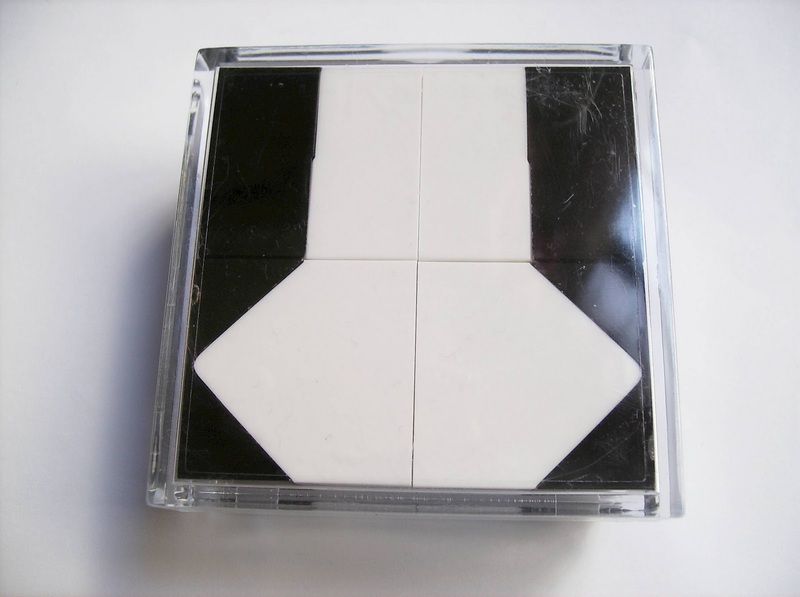 You also have the choice of three length sizes: A smaller one with only 18 blocks for a beginner; the standard size, the one I'm reviewing, with 27 blocks in a 3x3x3 cube and finally, for experienced puzzlers, a large version with 64 blocks in a 4x4x4 cube. When you first try to make any given shape, you'll notice that the blocks won't just turn in any direction. They're grouped together in small rows of three blocks and only at every third block, the direction can be changed by 90º. Well, there's a reason why each block has two straight indentations in opposite directions. They are used to let the elastic string come out in a different direction, thus allowing to shorten or extend the length of a block row. 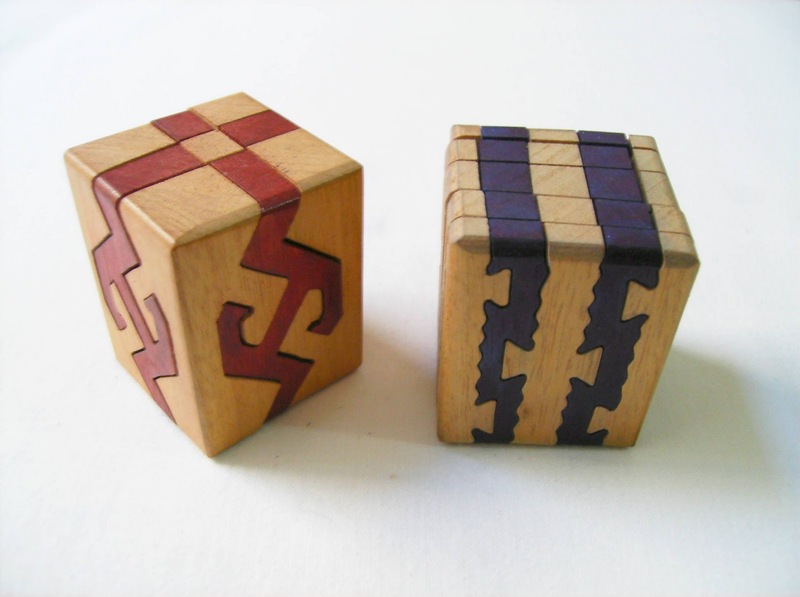 This clever features allows a wide number of possible shapes, otherwise impossible, and this is the key difference with other similar puzzles that used an elastic string. 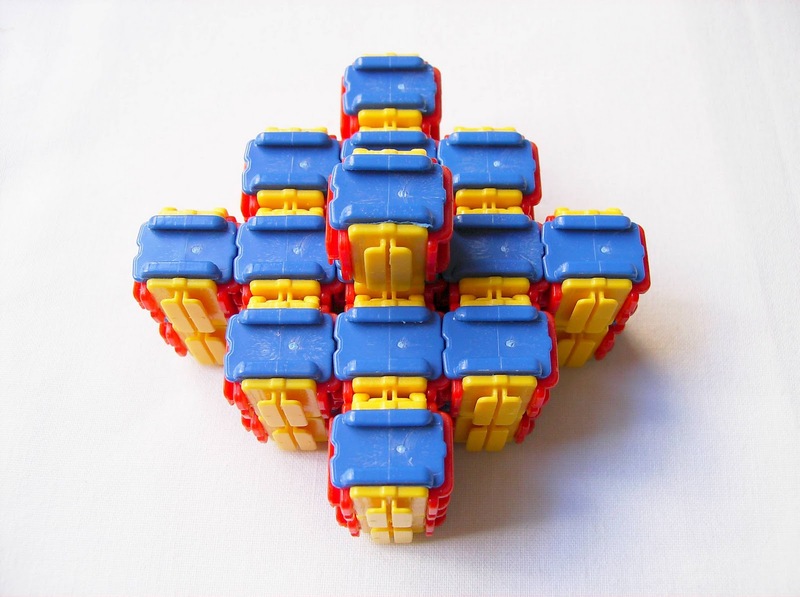 I have in my collection one of such puzzles, the Elastic Cube, and by having only solid cubes, the possible number of shapes you can build with it are greatly reduced. Once you understand the workings of the Shapeshifter and built all the shapes provided, you can start building your own creations. 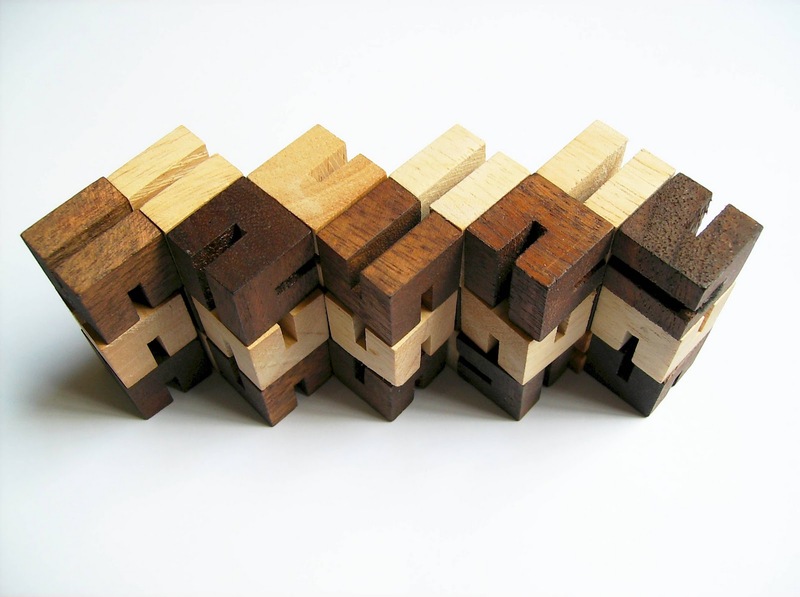 If you've create something cool and want to share your design, send an e-mail to Puzzle Crafthouse and they'll make sure to include it in a log on their website. Having played with various shape-shifting puzzles, the Shapeshifter by Puzzle Crafthouse is a welcome addition to any collection and a fun puzzle to keep around for killing time. If you have a creative mind and can come up with all sorts of shapes and forms, I strongly recommend getting one and give it a try. If you're feeling ambitious, why not try the 64 block version instead? 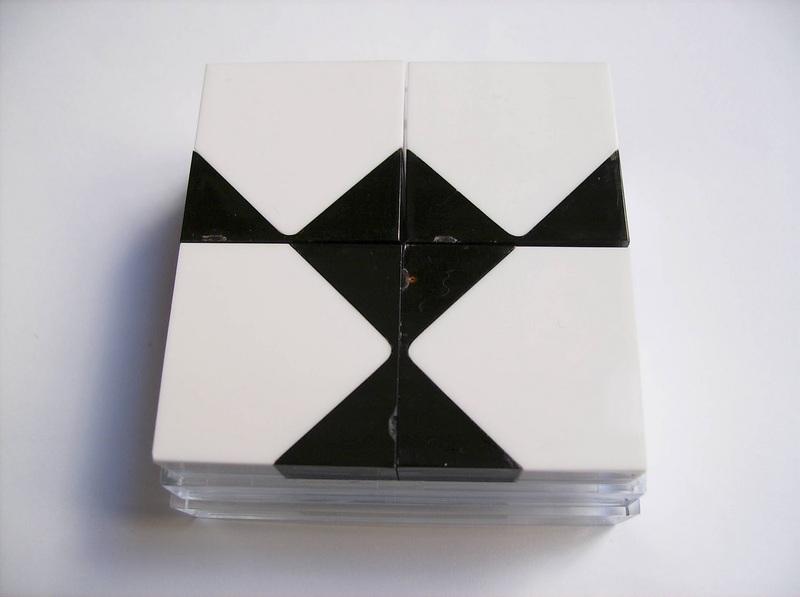 The Shapeshifter can be ordered directly from the Puzzle Crafthouse website $9.95. The 18 block version costs $7.95 and the 64 block version costs $15.95 USD. 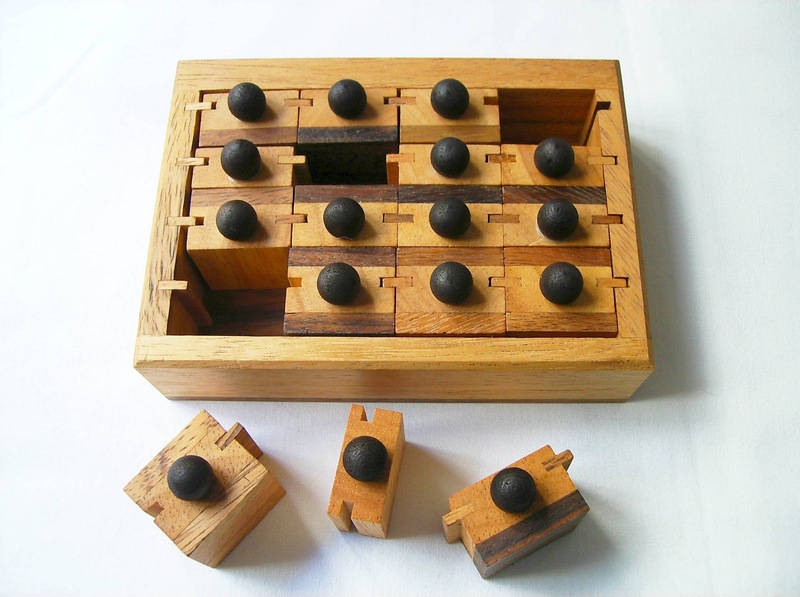 I have reviewed many great puzzles by the German designer Jean Claude Constantin and the Glühbirne (German for Light Bulb) is no exception. As of now, this is my favorite Wire/String Puzzle. The design concept and theme is so original and funny, it captures a puzzler's attention right away. 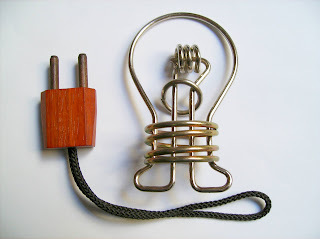 The wire frame in the shape of a light bulb is perfectly achieved. 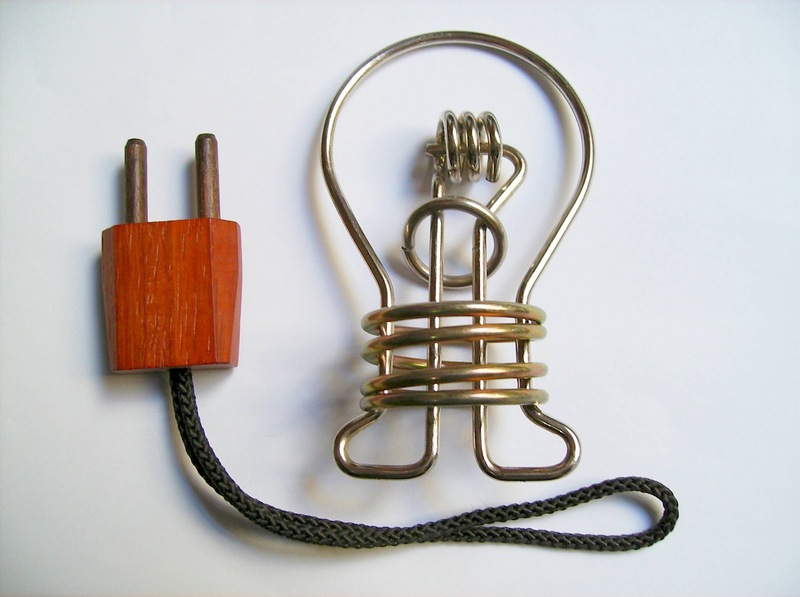 In fact, it's just about the same size as a standard light bulb and the goal is to remove the wooden plug and rope from its wire frame. The puzzle itself is not very difficult to solve. It's rated by PuzzleMaster as a 5/10 and I think it's about right, although I don't mind the easiness, because it's a break from the routine of having to try and solve other insanely hard Wire Puzzles. It took me just around 10 minutes to remove the plug, and returning it to the initial position was equally easy. When you first analyse the puzzle, you'll notice a small ring at the bottom of the frame. This ring is constraining the movement of the string just to the inside of the frame and blocking it from moving into the outer parts of the frame. So, the first step is to get the string to this very outer part of the frame and in order to do that, you're gonna need to pass the string through the small loop at the center of the light bulb and go around the wire that in turn also goes through this small loop. When you've done that, you're going to repeat that movement, but this time, you have to first make the string pass inside that small ring at the bottom. After the loop movement, just pull the plug with the string and it should just come out. To return the string to its original position, just repeat both steps backwards. No love/hate towards the Glühbirne like the other Wire Puzzles, just love... Yes, it's easy to solve, but fun, and after all, not all puzzles need to be complex and tough to be appreciated. I loved the theme of the puzzle and the whole concept of removing the plug from the light bulb was very well thought and executed. Well done Jean Claude! The Glühbirne (Light Bulb) is available at PuzzleMaster for $12 CAD (approx. €9). Over a year ago, I reviewed the plastic version of the Revomaze, called Obsession by Chris Pitt (please, refer to that review for more info on the Obsession series). At that time, I also reviewed what was supposed to be the next design version of the Obsession series, but apparently the design was never commercially available. Even though they didn't use the new look, they still took a few of its design features for the V2. They still use the rubber bubble badges, which I think gives a very stylish and polished look. 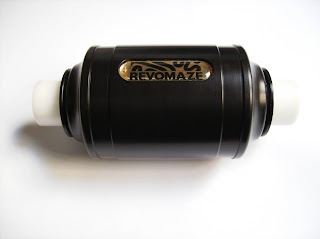 For the newcomers, the Revomaze is a Hidden Sleeve-on-Cylinder Maze Puzzle, where you navigate through an internal labyrinth and the goal is to remove the white shaft from the black sleeve. Not recommended if you easily loose your patience with puzzles, though... Right now, the V1 versions of the Obsession series are discontinued and no longer available, and the only ones you can choose from are the Blue V2, the Blue Pro V2 and the Black V2. The first new feature, which is quite useful, is that they flattened part of the bottom sleeve, to avoid rolling on a flat surface. In comparison to the older version, now most of the sleeve surface is smooth instead of straight groove lines across it. The edges of the sleeve were rounded, making it more slick and elegant, but on the contrary, the changes in the shaft are worse. The older version had a rough surface on the shaft, which was much better to get a grip, but now the new shaft was smoothed and it's more difficult to hold it, especially if you sweat from your hands... And believe me, after a while of playing with it, you'll probably understand what I'm saying. Another new feature, and this one is the best, is that finally the shaft comes out. With the older version, when you solved the maze and didn't see the actual shaft coming out, it seemed that the challenge wasn't complete and it was a bit of a let down. Now the solving experience is much more rewarding. Given the fact that I already owned a Blue Revomaze, I decided to go for the Black one (difficulty: 65/100), even though the new Blue Pro V2 version was available and was six times longer (difficulty: 70/100). The Black was apparently a good choice, although after more than two weeks, I'm still nowhere near the end of the maze. It took me about 8 hours to open the first Blue Revomaze, but the Black one has been a whole different beast. I've made some progress in the first few days, but after that it's been really difficult to keep going. It seems I always end up in a dead-end. Although I don't see the actual mazes, there seems to be a major difference between the blue and black versions. In most of the times, the blue was easy to navigate through the maze. It was like going leaning to a wall and follow a path, but with the black, a good analogy is like walking most of the time on top of a bridge, with no protection from the sides and if you deviate just a little off-path, you fall down. That's exactly my feeling whenever I hear that damned clicking sound announcing my failure once again. I'm guessing it will take, at least a few more weeks until I finally solve it. Note: In one of my "failures", I noticed that the shaft almost came close to the end. It didn't came out, but it was sufficient to see the tiny hole holding the paper with the serial number (this was how you'd know you had solved the puzzle in the V1 and the serial number was proof that you had indeed solved it). If it wasn't for the new feature of getting the shaft to come out, I could say that the puzzle was solved, but no... Design flaw? - Honestly, I don't know what to think of it, but I'm assuming it wasn't supposed for you to get access to the serial number before solving the puzzle. You can see a photo of this below. (Click to Enlarge) - No, not solved?! Overall, I have mixed feelings about the new V2 Obsession series. I love most of the new features, but compared to the Extreme versions, it's a shame there are no more different levels. I understand that the Extreme Revomaze is the flagship of the company, but if they want to reach a broader audience instead of only the "elite club", they need to come up with more captivating and affordable options. That means more different Obsession levels. Honestly, I still find very hard giving more money for a puzzle, just because it's made from metal. The whole experience of having and solving a metal version might be better, but in the end, the concept of the puzzle is the same, and to me, that's what really matters. 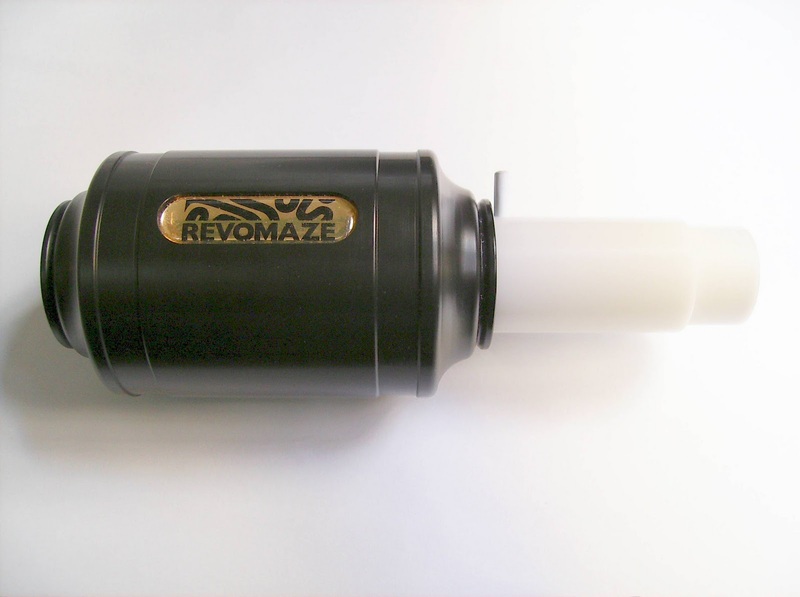 The Revomaze Obsession V2 can be bought directly from the Revomaze website, with prices starting from £20. 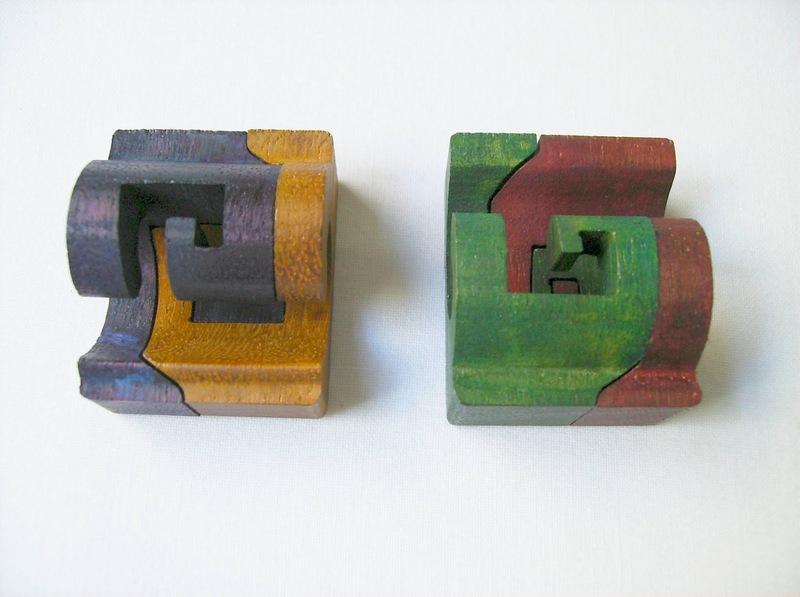 EDIT (Jan. 20): Since I first reviewed these two puzzles from Phil Exley, roughly three weeks ago, I got two more beautiful examples of his work. Read about them further below in this review or jump to here. 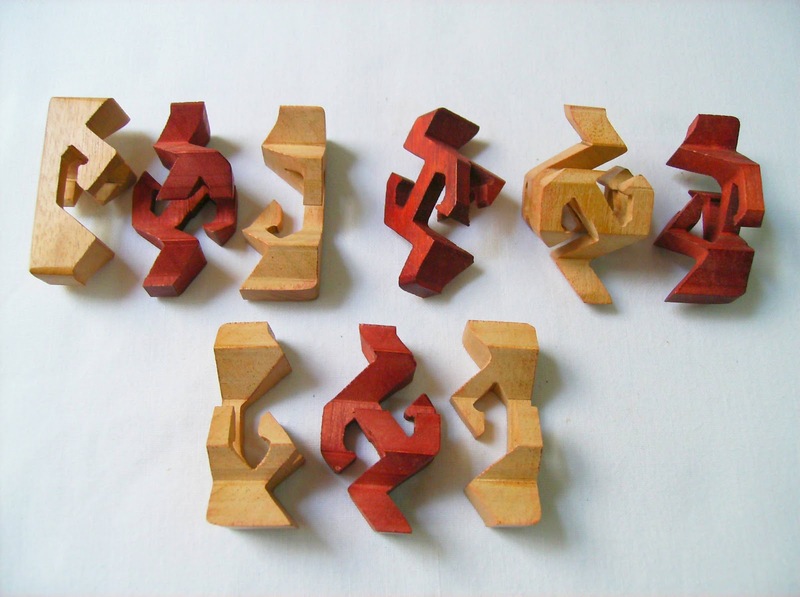 You can think of his puzzles as some kind of an interlocking 3D jigsaw puzzle. 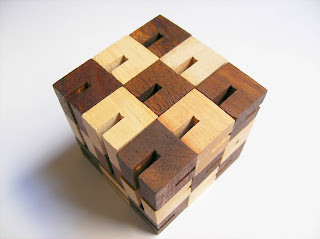 When taken apart, the pieces of a puzzle have a specific way to connect in order to reassemble it. You have to follow a particular sequence and solve the puzzle in steps. 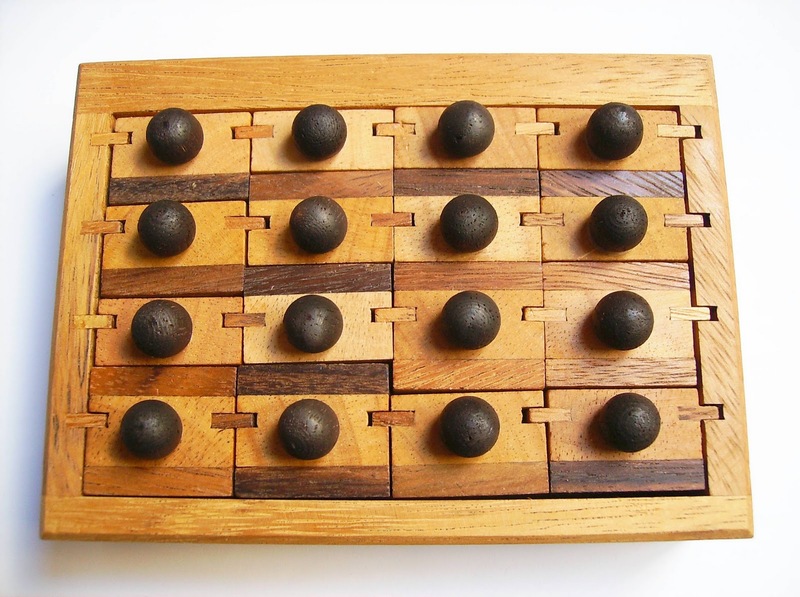 There are various difficulty levels available, from the simplest and smaller 4 to 9 piece puzzles, to the more complex and larger 49 to 64 pieces, with beautiful designs on whichever one you choose. The ones I chose for a first time purchase are relatively easy and small, compared to others. Both of them measure about 45mm height by 37mm length (1.77"x1.46"). The first one is a 9 Piece Celtic Design. You can choose two colors: one for the actual design, which can be red, black or plain wood and the other one for the surrounding puzzle or the corners, also from the three available colors. My combination of choice was red for the design and plain wood for the corners. 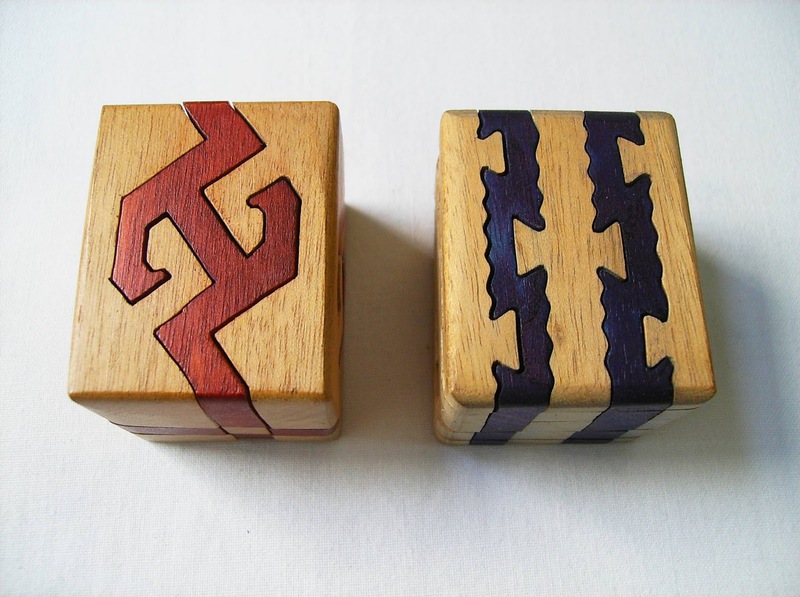 This way, the puzzle has a good level of contrast, while enhancing the actual Celtic design. There is a bigger version of this Celtic design available, which is three times bigger, but actually maintaining the same 9 pieces and obviously, an equal level of difficulty. 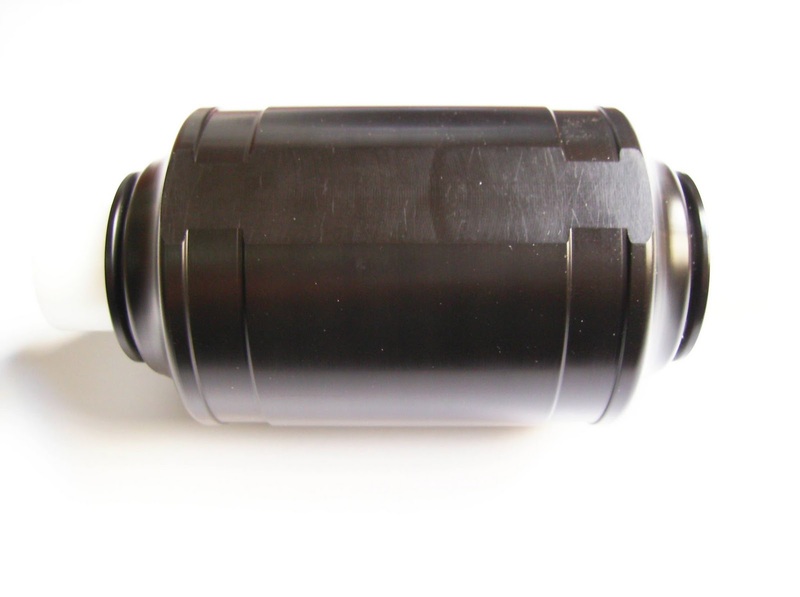 The end result is very nice and elegant, measuring about 40mm by 80mm (1.57"x3.15"). 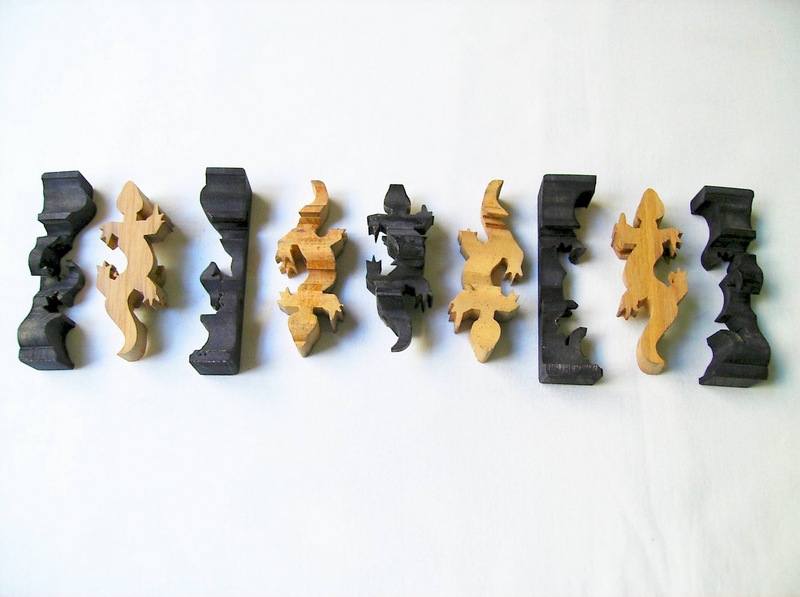 There are also other cool and stylish designs to choose from, like the Sea-Horse, the Lizard or the Yin/Yang puzzles. Taking the puzzle apart is easy and very intuitive. Essentially, the pieces can be divided in three layers, each with three pieces. Excluding the middle layer, the other two are a mirror image from each other. The part that can be more tricky, but nothing complex, is assembling it again. 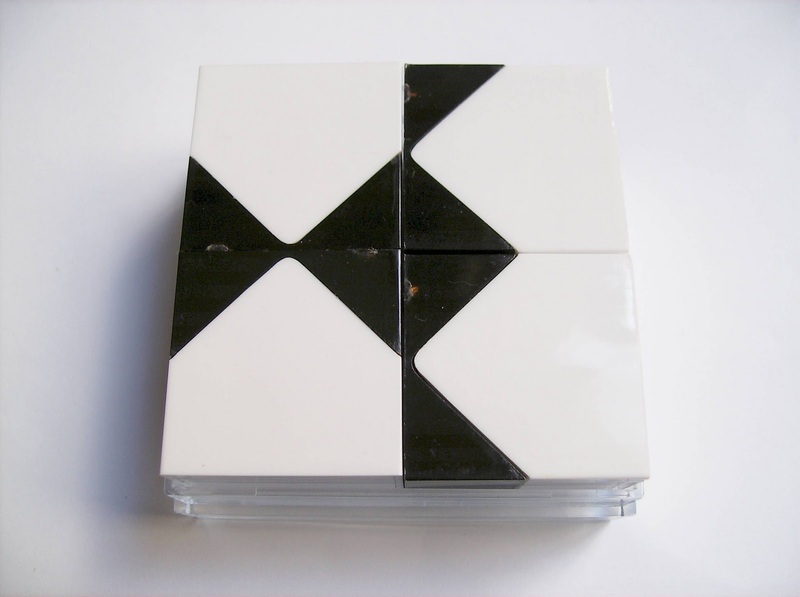 If you mix the pieces after taking it apart, it can take a few minutes to correctly guess where each one goes, giving the fact that some pieces are similar, but not actually identical. The only distinguishable piece that has not even a similar counterpart is the middle piece from the middle layer, so it'll be much easier to start assembling the puzzle from this one. The second puzzle I got was a small 25 Piece 2 Colors with wavy patterns. 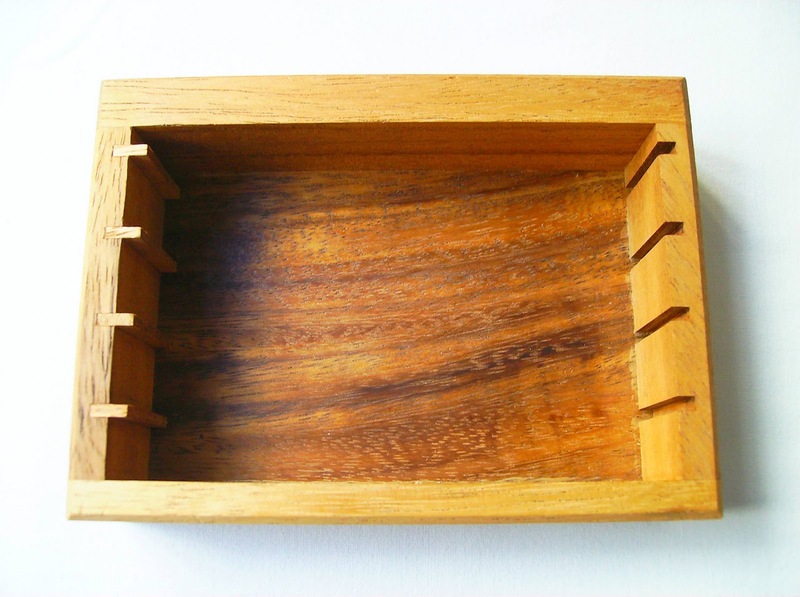 This one has a slightly bigger color palette to choose from, with five colors: red, blue, green, yellow and plain wood. This time, I chose blue combined with plain wood. 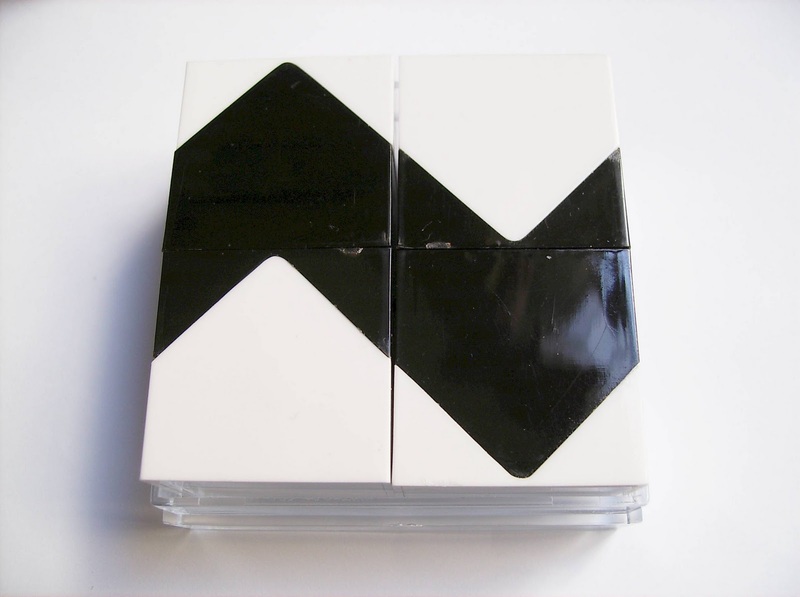 Since the puzzle has five layers, it will create a nice alternate effect between the two colors. The size is the same from the above one, but the larger number of pieces do make it a bit more difficult. Another different aspect is that almost all the pieces look similar, with no unique ones. Actually, to be more exact, every single piece is unique, but in a subtle way. What I mean is that, if you look at them at first glance, there's no apparent distinguishable one among all the others, like the 9-piece puzzle. 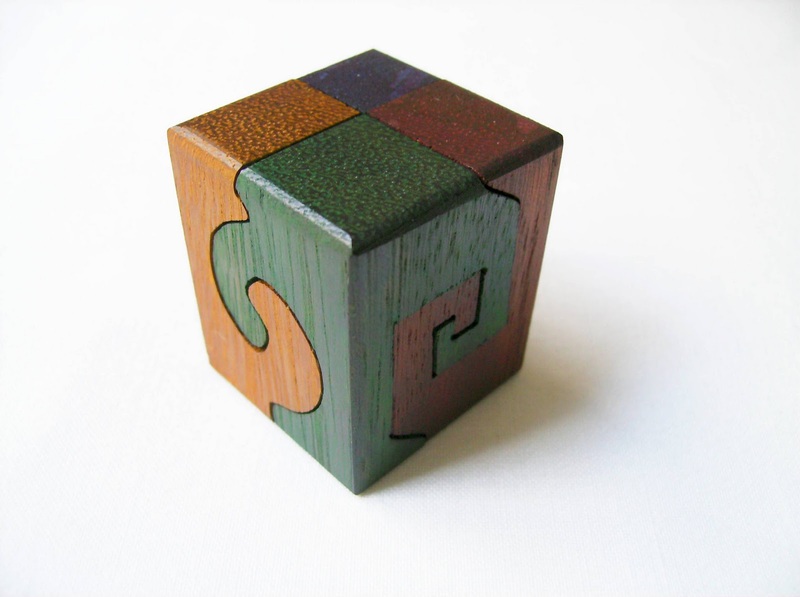 What makes every piece unique is the fact that all of Phil's puzzles are handmade, so the smallest cut imperfection on a piece will make it fit perfectly on just another one, although it might appear to fit with others. This is sort of like what you feel when building a jigsaw puzzle - sometimes a piece looks like it fits on a particular part of the puzzle, but it doesn't actually have that perfect fit, like all the others... This is actually a good thing, because when you're solving the puzzle, it adds a higher level of difficulty to it. Solving the 25-piece puzzle is no different than the first one. You start by building the five layers, one at a time and then sliding each to the corresponding one. The only noticeable detail between the layers is that the middle one is a bit wider than the other four, so it'll be easier to pick the five larger pieces and connect them first. Next, you can build the two colored layers and slide them onto the middle one. 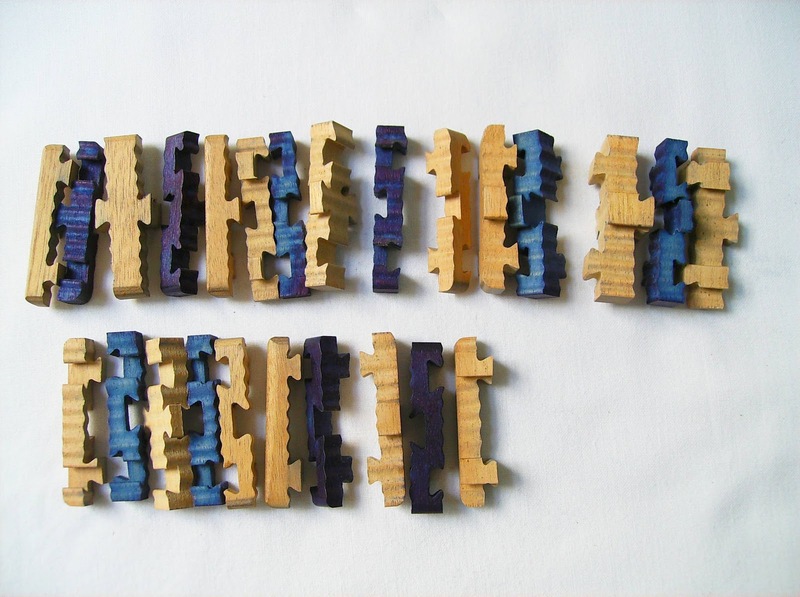 Spotting the colored edge pieces from the middle ones is easy, because they have a darker blue tone. You'll be then left with only ten pieces after this, to build the remaining edge layers, and you're done. The two new puzzles that I got from Phil Exley are a 4 Piece Puzzle - 4 Colors and a Lizard Puzzle. 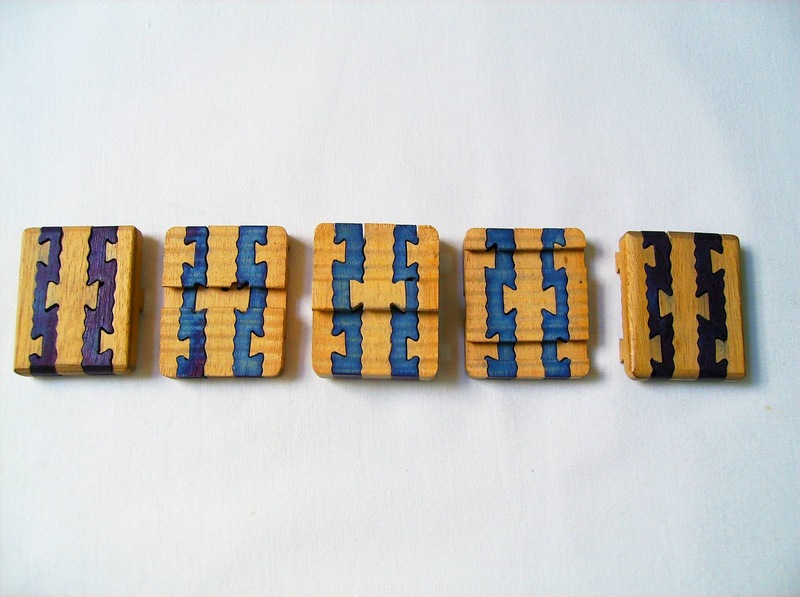 This 4 piece puzzle is a little smaller than the Celtic Design above and the 25 piece one, measuring about 35mm length by 40mm height (1.38"x1.57"). Its particularity, though, is that it has four colors instead of the standard two - yellow, red, green and blue. Another nice feature is that, instead of one design in its four sides, it has two, alternating between a wavy spiral design and a straight lines spiral design. 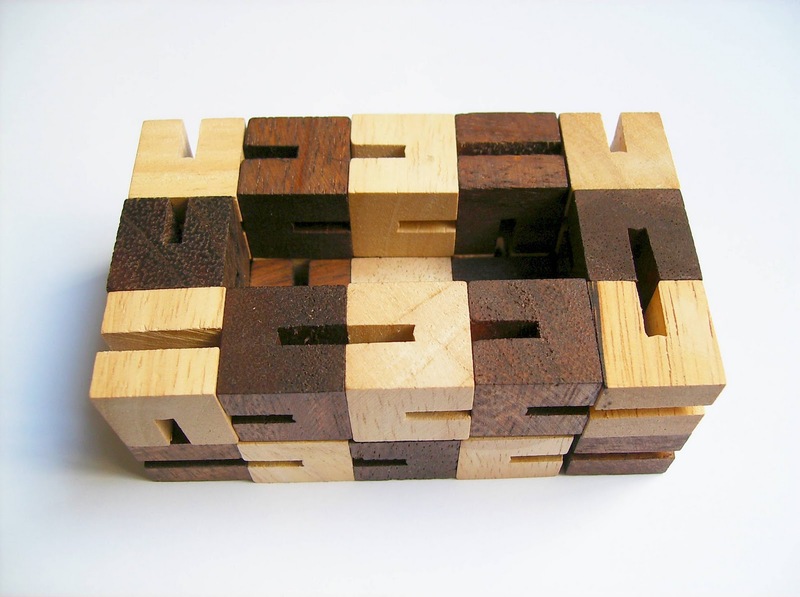 Solving this puzzle won't give you headaches, but it's definitely a nice display puzzle for a desk or it will be a nice addition to a collector's shelf. 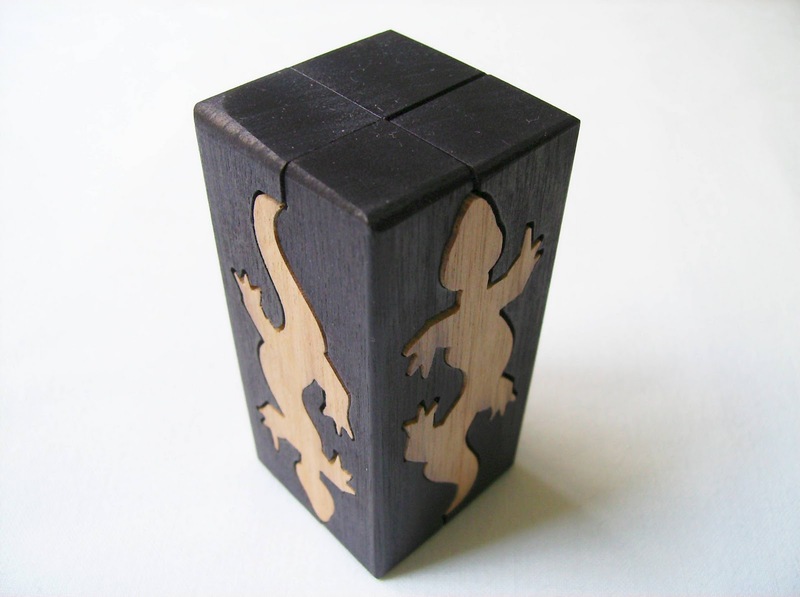 The Lizard puzzle is fascinating. This 9 piece puzzle is described as to have an Escher-like feel to it and I totally agree. The lizards merge into each other within the block and sort of creates a fantastic pattern, alternating between one straight up lizard and one upside down. 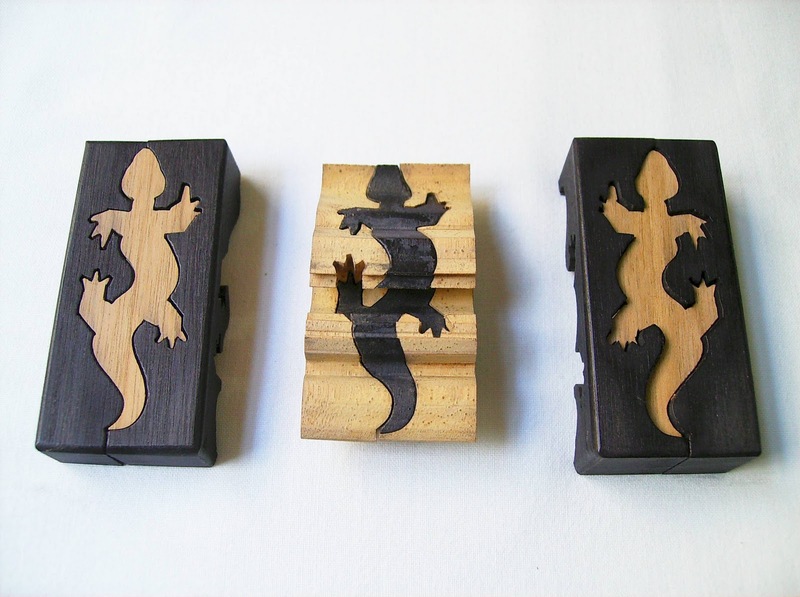 The color combo is black and plain wood for the design, and although it consists of 9 pieces, the Lizard puzzle is a bit bigger than the standard 9 piece puzzles, measuring about 70mm height by 35mm length (2.76"x1.38"), which makes it look even better. What amazes me the most in Phil's work is that the pieces aren't laser cut, but manually cut instead one by one. The level of precision it requires to make all these shapes are astounding and something worthy of appreciation. I was very happy to have found Phil's 3D puzzles. Even more, because they're found right here in Portugal, where I live, which unfortunately, doesn't have a known mechanical-puzzle tradition or variety of stores, for that matter. Worth mentioning is the "green way" all Phil's puzzles are built: He uses wooden offcuts from local carpenter shops, which would otherwise be used just as firewood, and then selects and cuts what he can take to build his puzzles. Also, all his machines are powered by solar panels.